I’m one of those people who’ve “Been There and Done That” when it comes to staying cool in Summer months. I’ve lived in the hottest parts of Arizona itself. I know how dreadful a scorching day of Summer can be. No, I didn’t have an AC with me back then. I had my good ol’ classic Fans. Cooling temperature of a room with just the two fans might sound a bit of a stretch to many of my readers, but it isn’t. I didn’t go into battle empty-handed. I had my own tricks and hacks! Simple tweaks around the house saved me a good chunk of electricity bill too! Believe it or not, effectively using this basic electric device can bring about a certain level of comfort that people deem impossible without an AC. Wondering “How to Cool a Room with Fans?” Well, I did it, so can you! Just follow my strategies and bag of tricks. You’ll be fine. This one is a bit strategic. Before placing window fans besides the windows, make sure the said windows are tall. Why? Well, hot air generally rises upwards. Tall windows will help people getting the air out quicker than the short ones. If your windows are shorter, make sure to renovate. Try and place the fan at the bottom of the window while covering for all the gaps that are there when you are setting up the fan. Using tapes to cover them is always a handy solution. This way, the fan will be the sole carrier of wind inward and outward resulting in a faster cool-down period of the room. Choosing the “Right” Fans Matters Too! Since we are trying to use two of these devices, let us consider that one of these is a ceiling fan as well. Position the window fan near a large window. Don’t use one that is too large for the window you are placing it on. Moreover, consider the fact that smaller fans are less powerful than the bigger ones. But the bigger fans consume more energy and cause you to loosen up your wallet. So, make a wise choice regarding the window fans. For the ceiling fan, measure the CFM rating it has and the noise level of the tool. It is also good to check on the “Speed Variations” these things have. The more, the merrier. Make sure that they rotate counter clock-wise. One can use table fans on the job as well. Since we are done with the selection of fans, let’s focus on a handful of ways you can make this combination work. All you need to do is to follow any of these tactics. We’ll be discussing how to cool a room with two fans (not three or four). Let’s have a look at a few of them. 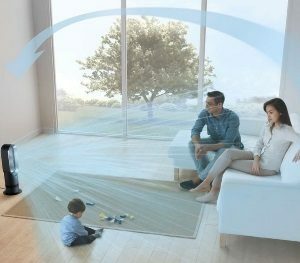 To put it simply, you need two fans to create a “Crosswind” across the room. If you are using a table fan, place it near the window facing outward. Turn on the ceiling and table fans. Table fan will carry the warm wind out and ceiling fan will draw the cool air in. This thing is done better with a window fan (or two) and a ceiling fan. Turn on the window fan and open up the window. If there is a door or two in between the distance of this and the other fan, leave it open. Then, turn on the other fan in the same or the other room. One fan will draw the cool air in, the other one will expel the hot air out. In between, the air will get cooler as it travels. Remember to keep one window of the room open so that the hot air may escape. I’d advise people to do this when the sun sets. Have You Tried the Ice Bucket? If you haven’t, this is the perfect time to do so. If you have one fan bringing the air into your room, this is a strategy that cools the space within the shortest time possible. Whenever the sun sets, bring out ice packs or a small bucket of ice or cold water from the refrigerator. Put it in the direction of the wind. The ice will melt. The air will cool down as hot air comes directly in contact with cold water or the ice. This is due to “Extending” system. Basically, the cold water absorbs the heat and becomes hotter while the air cools down. Make sure to do this at night so that no external heat can melt the ice. The kitchen is also a part of your house, right? Why leave it behind in the “Cooling” race? Get an exhaust fan in place in your kitchen. This will take the all the stale air out of your vicinity and fill it with the cold and odorless air. Be sure to leave it on throughout the day. Having a ceiling fan there is a good option too! In addition to that, make sure the counters are properly placed near the windows for optimum ventilation. This, along with the fans, will help. One should consider frequent disposal of garbage bins too. How to Go About the Bathroom? The bathroom is a different story altogether. This is similar to cooling the kitchen in the sense that you need to take the stale air out. You need to get an exhaust fan dedicated to the task. A ceiling fan is also required. Only thing is, you need to position it in such a way that a breeze of bad smell doesn’t hit your nostrils. In my opinion, one should use tower fans. These are good for two reasons. First, you can adjust the height according to what you need. Secondly, these fans often come with night lights or CFL bulbs. These help people to see better during the night time. Do check the warranty and the energy consumption levels for different models. These are vital. If you thought only ACs could give you cooler rooms during summer, you were in the wrong, my friends! At least before you came across this post. Now you know better. Hopefully, I’ve cleared the air about how to cool a room with two fans. In addition to following these tricks, you guys can implement tricks like keeping curtains of your windows down during the daytime. This helps by not letting sunlight and extra heat inside. People can use blinds too! Those need to remain close. 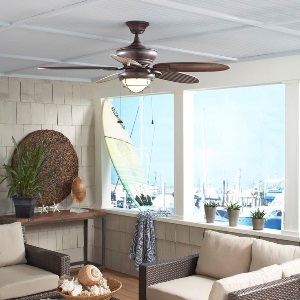 Keeping the ceiling fan on throughout the day minimizes heat invasion. You can choose the ones that consume less energy and use less power output for the job. Don’t worry, with the top models, performance won’t degrade at all!